Make a vinaigrette by mixing the vinegar and garlic then whisking in 6 tbsp olive oil to form an emulsion. Season and set aside. Put the peppers under a hot grill, skin side up. Cook until their skin blackens, then put in a bowl and cover. Once cool, peel and slice thickly. Put in a bowl with a spoonful of vinaigrette. Season. Top and tail the aubergines and slice thinly lengthways. Lightly brush on both sides with 3 tbsp olive oil. Season. Place some of the slices in a griddle pan over a medium-high heat. Grill for about 4 minutes each side, until tender and marked by griddle lines. Remove to a large bowl and lightly dress in vinaigrette before cooking the remaining aubergines. Trim the salad onions, leaving plenty of green attached. Drop into a pan of boiling water and cook for a few seconds. Drain and cool under the cold tap. Pat dry, toss in 1 tbsp olive oil and griddle very lightly for a minute or so, turning, until flecked with gold. Remove and set aside. When ready to serve, slice the Mozzarella. Dress the leaves with the remaining vinaigrette. 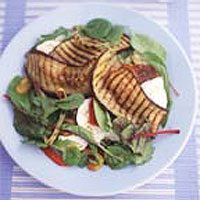 Immediately divide the salad leaves between four plates (or use one large serving dish), add the aubergine, Mozzarella and peppers. Garnish with the salad onions and coriander. Serve.